At home she has to share. To her right is Inca, my son Ben’s dog. 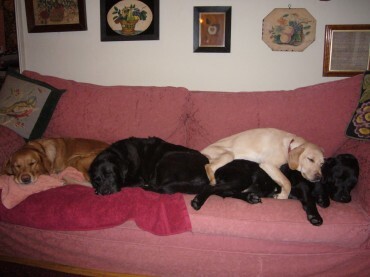 To Inca’s right is Lola, her daughter, my daughter Tamara’s dog and on top of Lola is Lola’s daughter Marnie, also Tamara’s. This entry was posted on Tuesday, September 28th, 2010 at 2:52 pm	and is filed under News. You can follow any responses to this entry through the RSS 2.0 feed. Both comments and pings are currently closed.